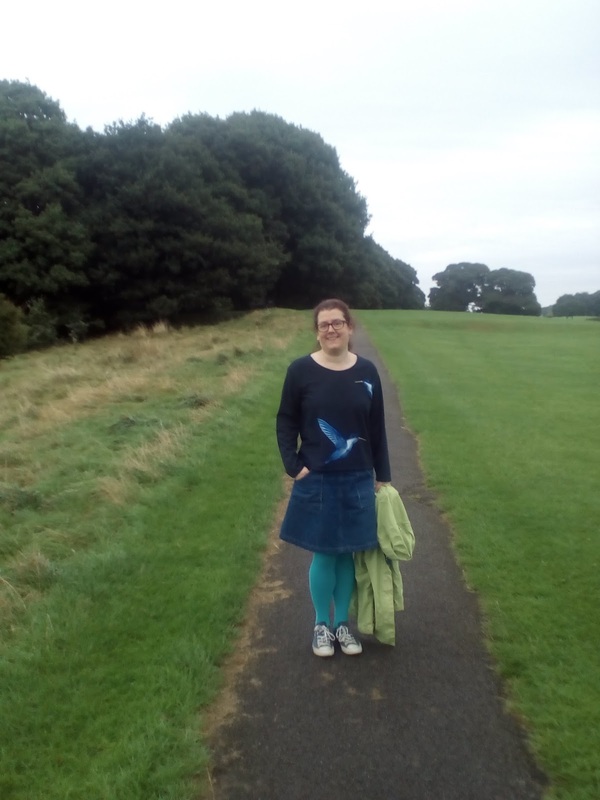 I took part in OWOP 2014 hosted by the lovely Handmade Jane and foolishly chose the skirt New Look 6106, I had a bit of a chilly week. 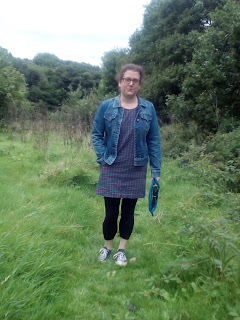 So when I read that Hannah of Cinderellis Sews was hosting this year I decided to select and easily layer-able pattern. 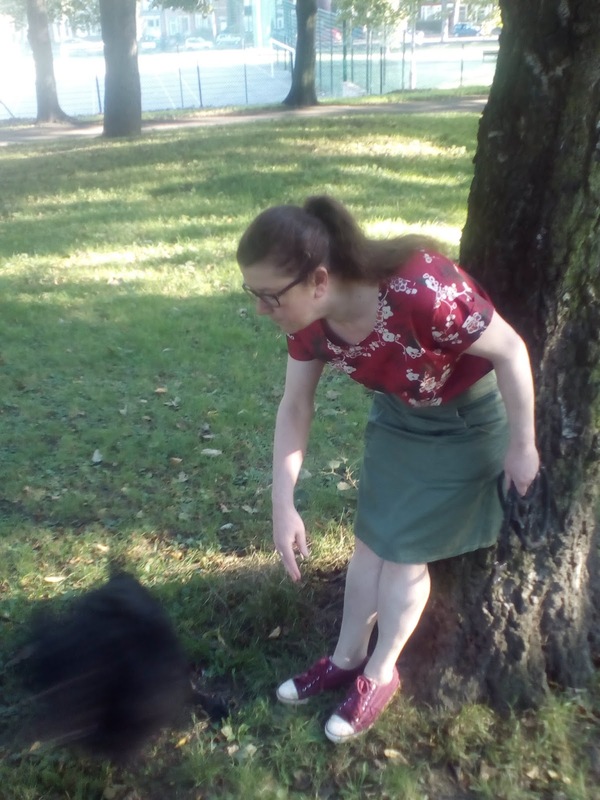 I chose the Paprika Patterns Onyx Shirt, it was an easy choice as I have 11 different versions of it already and plan on having more. Although Onyx is designed for woven's this is my sweatshirt version and a warning to check the scale of a print before buying fabric online. This is my very first version of the Onyx Shirt, that I made from recycling a man's shirt. However, it was my least worn, as it was a little tight and looked like scrubs. OWOP made me try and resolve these issues, so I added a bit of width to the back and made the cuffs in a contract colour. I will now wear it a lot. I love this red version, it's a lovely quality cotton (I also have it in a blue colour ways) and is definitely a dressier iteration. This may not be the best picture, but it had added Bonnie in it. 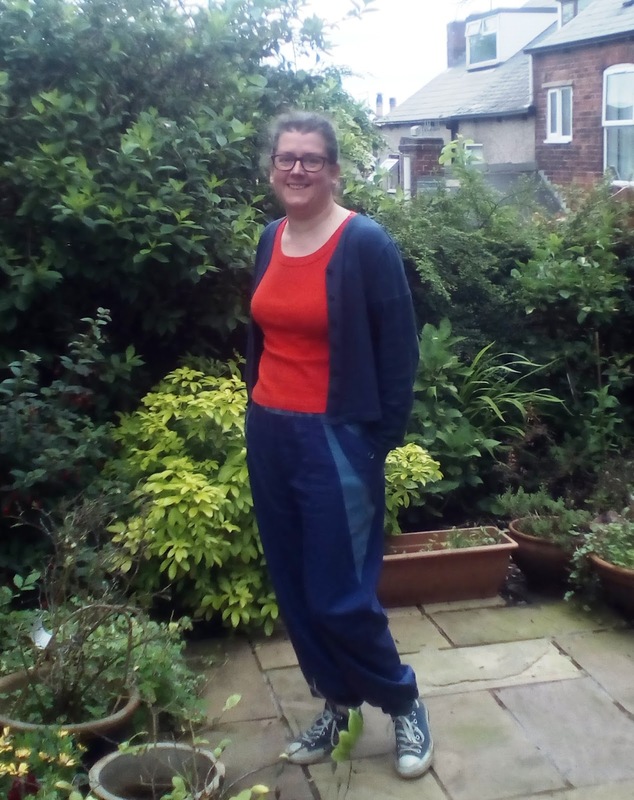 The weather decided to be changeable today, so the leggings out and my check tunic version went on (I always worry that this looks like an Australian school uniform and I am no schoolgirl). Better weather today, so the top that looks like I made it from a tablecloth came out. In person the green cardigan didn't look out of place as there is a green check next to the red check, the photo just doesn't pick it up very well. 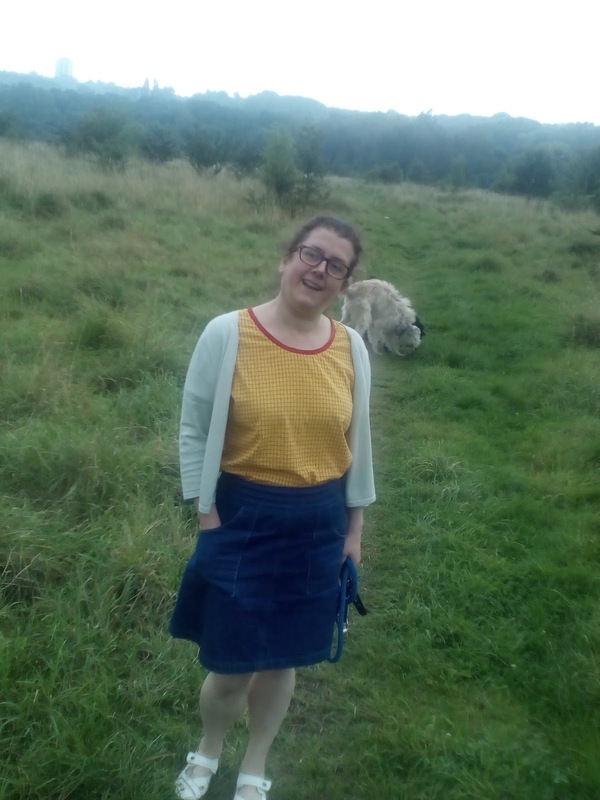 This photo with added Hagrid. 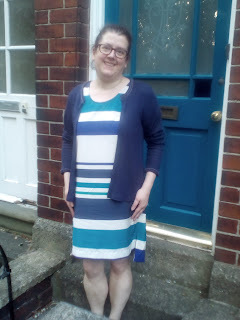 My subtle stripe dress version today. I liked the split hem on the Inari Tee, so I copied it. What you can't see are my matching purple Vans. This is a t-shirt version of the Onyx and it's only really the cuffs that don't like the softer stretchier fabric. I'm wearing it here with my Grainline Moss Mini, and a surprisingly still Bonnie and I didn't even have any biscuits. 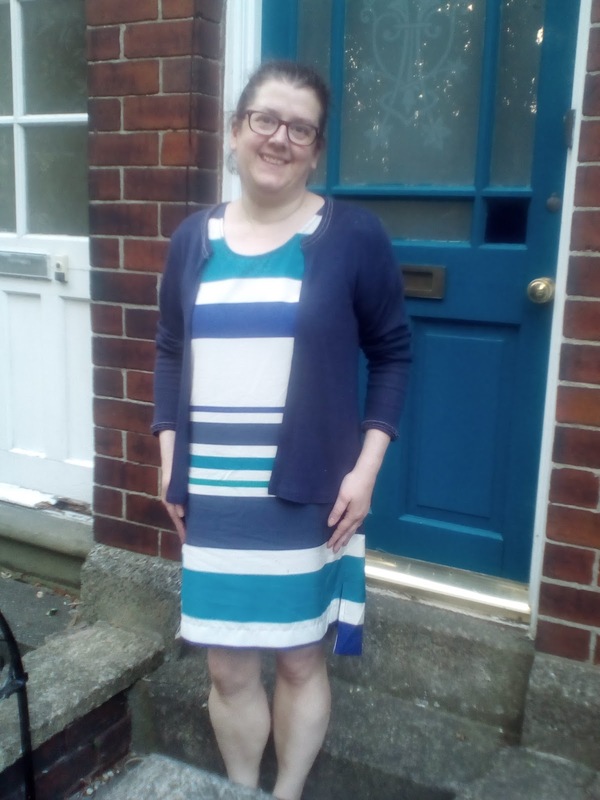 A colour-blocked dress version, inspired by the Christine Haynes Lottie dress. This was made with fabric that has been sitting in my stash for well over a year and I'm really happy how the dress came out, especially the hidden pockets. 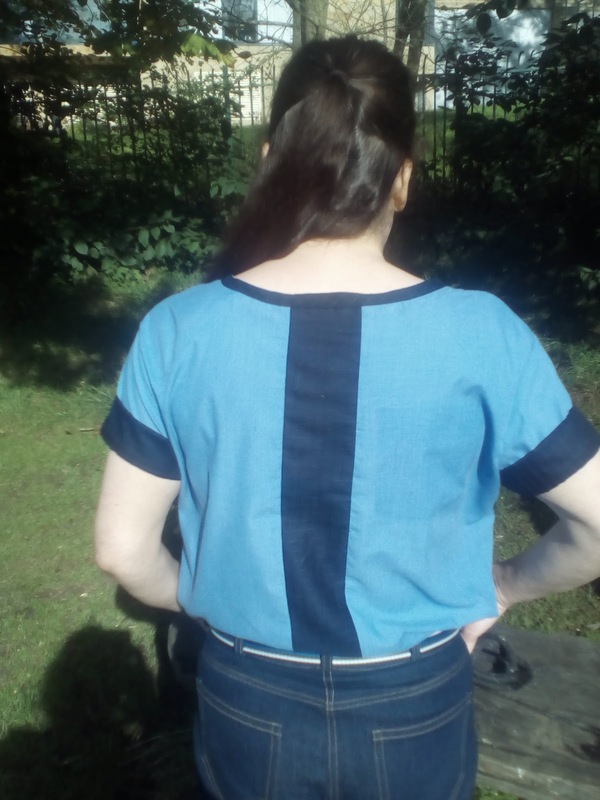 I didn't think I would be able to post anything during Hack It week on the Monthly Stitch, hacking patterns is not something I generally do. I might add the odd pocket or turn a top into a dress, but nothing really big. 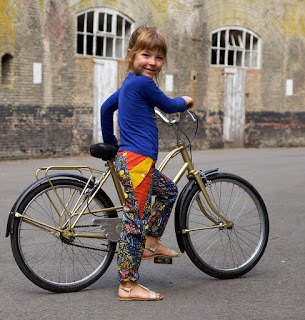 Then Marte at Compangie M. released the Noa Pant pattern for kids for 1-10 years and I just loved the pocket detail and I really wanted a pair. 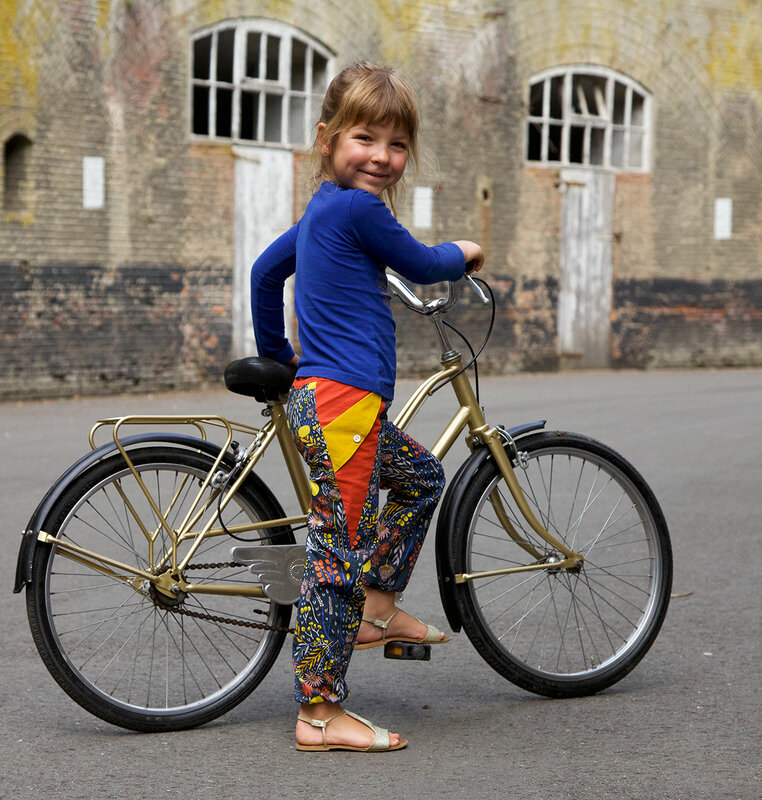 So how do you change a kids pattern into an adult pattern. A printer, a photocopier and a lot of sticky tape. I also used an existing pattern that I knew fitted to compare and contrast. 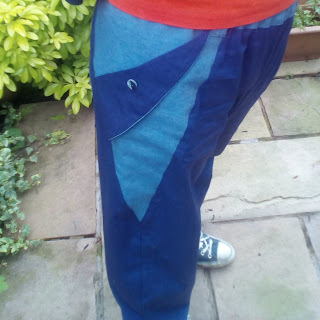 I enlarged the pocket and top half of the trouser pattern by 120% and extended the crotch at the front and the back. 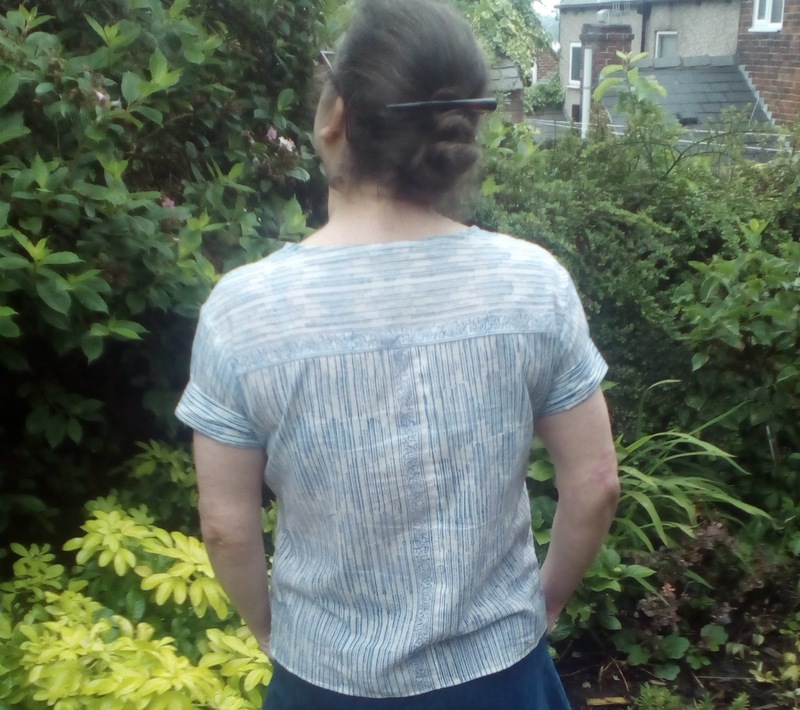 I then did something I never do, made a muslin and it's a good job I did because I needed to add a 3cm insert if I wanted to get the trousers over my hips. Here's the pocket details I love so much. I think I may need to move the button down a little. The dark blue is a lovely bamboo cotton mix and the light blue is linen (I hope they wash well together), both crease like it is going out of fashion. I did think about changing they from elasticated to a fitted waistband, but that was just going to be too complicated in the timescale given. And finally a sympathy shot, Hagrid got an ouchie last week chasing after Bonnie, who was chasing after a squirrel. How many tops, it too many? 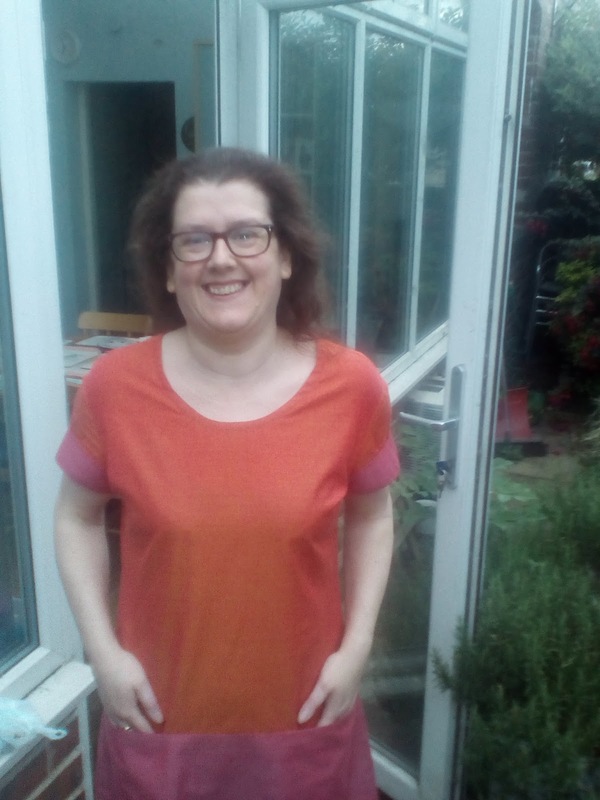 My love of the Paprika Patterns Onyx Top continues, these two version are actually the ninth and tenth time I have made this pattern (those ten versions weren’t all for me, one was for my Mum), it is my go to pattern for a woven top. Let me gush talk about the pattern first, it’s only available as a pdf, but I’m one of those strange people who actually finds cutting and taping pdf patterns together therapeutic. 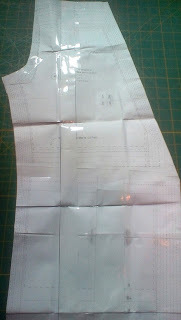 For me the added bonus of a pdf pattern is I can print it out again if I misplace my pattern (between cutting out the top version on Friday and the dress version on Monday I had misplaced the pattern and had to print it out again). The pdf is layered so you only have to print out the size you want and the size range is generous from an 80cm to 124cm bust. And the largest size only used 15 sheets of paper, with the instructions only using 7 sheets. Lisa’s instructions are clear and concise, with additional tutorials on the website, if needed. For both versions I made a size 6 at the shoulders and bust, grading down to a size 5 at the hips. 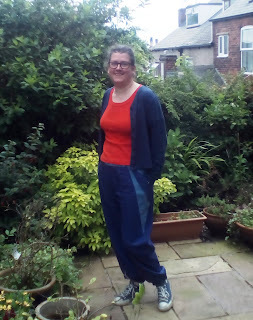 In previous versions I have lengthened the bodice by 5cm (I have a strangely long back), but for the blue version I left it at the original length because I had only bought 1 metre of fabric, 112cm wide. 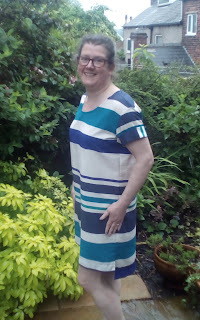 Anyway let me tell you about the fabric, it’s from Faberwood, who I found through the Paprika Pattern website, but who are actually based here in Sheffield about ten minutes from where I live. 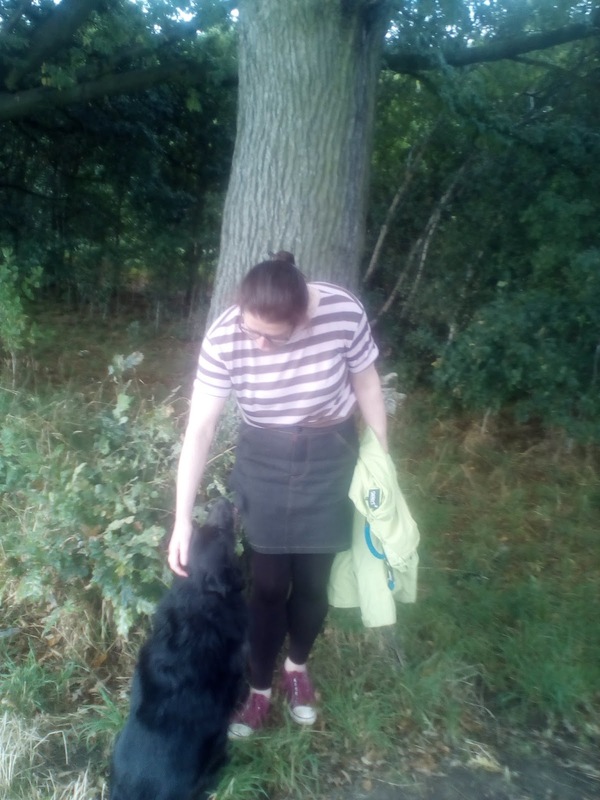 I emailed the lovely Fiona who runs Faberwood and asked if I could collect my order rather than have it posted, she said yes, and I got to meet her and chat about sewing and fabric, whilst my patient husband and not so patient dog waited in the car. It is a dangerous thing having such lovely fabric right on my doorstep. Check them out, but bear in mind Fiona is an enabler, she included swatches of all their lovely fabrics with my order. 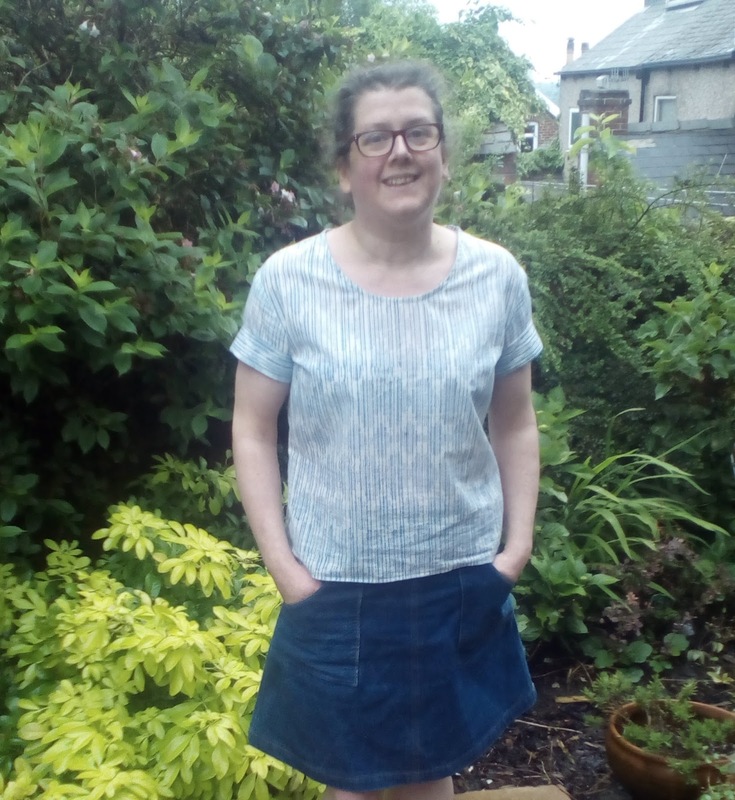 The fabric I choose was a blue Indian block print that is kind of the soft lightweight cotton I have been looking for for ages. It has a border print, but only on one edge, which I tried to use to its best advantage. I would have loved to feature it on the front hem, but as the hem on the Onyx top if slightly curved, I don’t think it would have looked right. I could say the pattern on the cuffs going in the opposite direction was a design feature, but that was the only way I could fit all the pattern pieces in 1 metre of fabric. 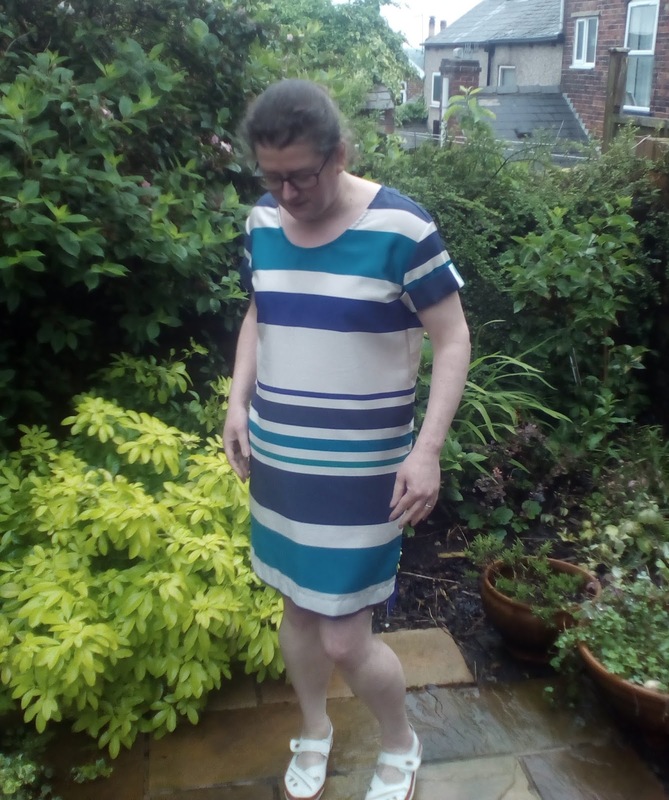 On to the dress, this fabric doesn’t have an interesting back story; it was from The Textile Centre on ebay and is a lovely viscose. All I did to change to top into a dress was extend the pattern by approximately 35cm, I just eyeballed it when I was cutting it out. I liked the idea of the split hem as seen on the Named Clothing Inari Tee Dress, which was very easy to do, especially with the broad stripe to follow on the fabric. 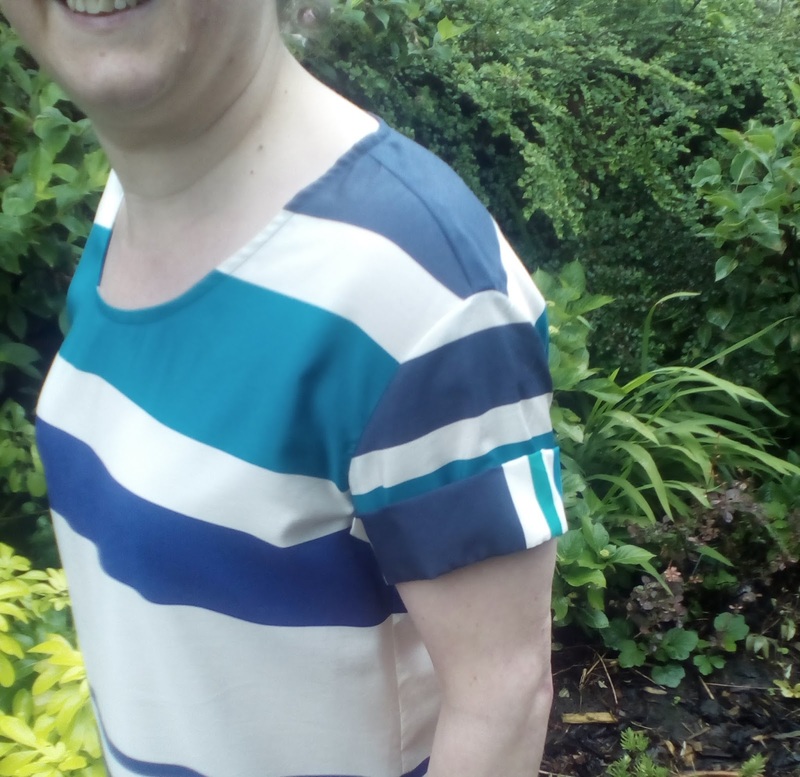 I just have to say how happy I am with the stripes matching on the side seams. 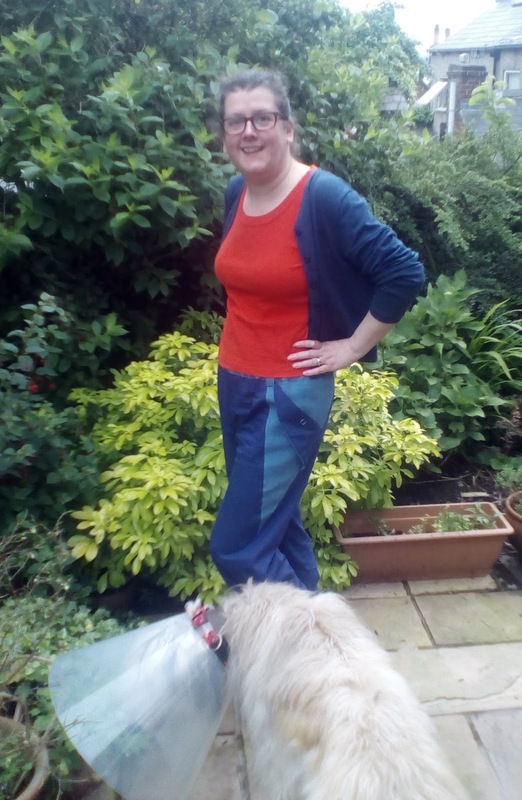 So those are my two makes, which will hopefully get a lot of wear this summer, it the rain ever goes away and the sun comes back.